Ever have one of those mornings where you wake up, jump in the shower, turn on the radio and hear the best news you’ve gotten in ages? No, not world peace. But close. Apparently, coffee is now good for you. It holds a host of physical – not to mention psychological – benefits which scientists are only now beginning to appreciate. In a household where our espresso machine holds a hallowed place, this is definitely grounds for rejoicing. I haven’t been this excited since I learned that sugar made a comeback. 1. It reduces depression in women. This just in. A new study out of Harvard University shows that women who regularly drink coffee — the fully caffeinated kind — have a 20 percent lower risk of depression than nondrinkers. This comes on the heels of previous research showing that the risk of suicide decreases with increased coffee consumption. So by all means, toss out that Paxil and fire up some French Roast. 2. It lowers the risk of lethal prostate cancer in men. But it’s not just the ladies who will benefit from more java. In another study out of Harvard (what are they drinking there? ahem!) men who drank six or more cups per day had a 60 per cent lower risk of developing the most lethal type of prostate cancer and a 20 per cent lower risk of forming any type of prostate cancer compared to men who did not drink coffee. Given that prostate cancer is the most commonly diagnosed cancer in men, that’s nothing to sneeze at. 3. It may protect against head and neck cancers. A study from the University of Utah showed that people who drank more than four cups of coffee a day had a 39% decreased risk of cancers of the oral cavity and pharynx combined, compared with those who didn’t drink coffee. Regular consumption of coffee has also been linked to a lower risk for brain tumors, reduced rates of colorectal and endometrial cancer as well as liver cancer and cirrhosis. 4. It may ward off Alzheimer’s disease. Several studies looking at how caffeine affects brain development in mice have confirmed that caffeine significantly decreases abnormal levels of the protein linked to Alzheimer’s disease. When aged mice bred to develop symptoms of Alzheimer’s disease were given caffeine – the equivalent of five cups of coffee a day – their memory impairment was reversed, according to a report issued by the Florida Alzheimer’s Disease Research Centre. Should these results be replicated on humans, it might suggest coffee as an effective treatment for this disease, rather than just a protective strategy. 5. It appears to stave off diabetes. Numerous studies have shown that coffee may be protective against Type 2 Diabetes, although the precise mechanism is not well understood. An analysis in the Archives of Internal Medicine, for example, found that people who drink three to four cups of coffee a day are 25% less likely to develop Type 2 diabetes than those who drink fewer than two cups. In the United States alone, nearly 24 million children and adults in the U.S. — nearly 8 percent of the population — have diabetes. Type 2 diabetes is the most common form of the disease and accounts for about 90 to 95 percent of these cases. Whether these studies will prove robust in coming years – or be cancelled out by some of caffeine’s adverse effects on things like sleep and high blood pressure – remains to be seen. But I’m going to blithely hedge my bets and carry on enjoying my cuppa (or two). 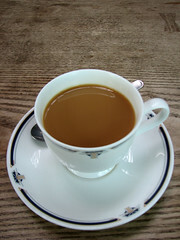 Image: Coffee by Mshades via flickr under a Creative Commons license. Sounds excellent, but how do you get 5-6 cupps down withthout serious indigestion??? I read this recently as well, and couldn’t have been more delighted (she says, heading over to Mr. Coffee, to get the third pot brewing…).